Speaking about the migration crisis at the U.S.-Mexico border, the Trump administration's border chief said Sunday that the United States needs to "invest in Central America," which was at odds with a tweet from the president saying he would cut off aid to those countries. "I think this is a multi-faceted problem that requires a multi-faceted solution," Kevin McAleenan, the commissioner of U.S. Customs and Border Protection (CBP), told "This Week" co-anchor Martha Raddatz on the crisis at the southern border. “We also need to invest in Central America," he said Sunday. "The State Department's announcement of an unprecedented increase in aid, I think is a tremendous step forward. Our green shoots of progress, both on security and the economic front in Central America, we need to foster that and help improve the opportunities to stay at home." 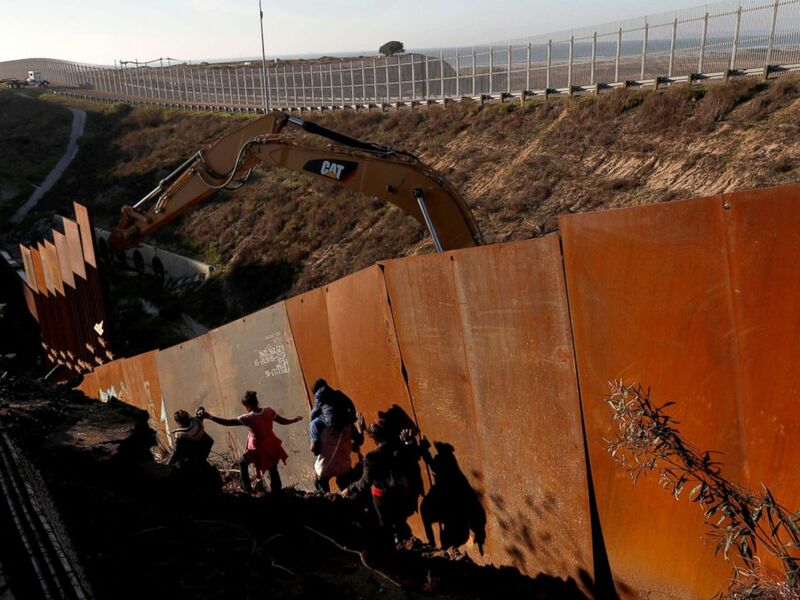 Migrants, part of a caravan of thousands from Central America trying to reach the U.S., climb down a steep hill after giving up on trying to climb the border wall into the U.S. from Tijuana, Mexico, Dec. 13, 2018. On Friday, President Donald Trump said in a tweet that Honduras, Guatemala and El Salvador "are doing nothing for the United States" and that the administration "will be cutting off all aid to these [three] countries." CBP has come under increased scrutiny over the past month after two children died in its custody in December, the first such deaths in more than a decade, according to McAleenan. McAleenan has served as the CBP commissioner since the beginning of the Trump administration. He served first in an acting capacity and was confirmed by the Senate in March 2018. McAleenan previously served as deputy commissioner during the Obama administration, beginning in Nov. 2014. "Let me go back to Honduras, El Salvador, Guatemala ... You talked about that aid package." Raddatz said on "This Week." "If there wasn't aid going into there, if that aid was cut off, what would the result be? More problems?" Commissioner of Customs and Border Protection Kevin McAleenan testifies during a Senate Judiciary Committee hearing on Dec.11, 2018, in Washington, D.C.
McAleenan responded that the three Central American governments need to be "an accountable partner" to the U.S.
"When we work together with well-targeted programs and really targeting them at areas that ... we're seeing migration, like the Western Highlands of Guatemala where there's a real poverty and hunger crisis -- it's one of the most food-insecure regions in the hemisphere, huge rates of malnutrition," McAleenan said. "USAID along with USDA have great programs there to try to foster that but we need the government to step in and join us in that effort. And I think with the Mexican government coming in now also expressing investment and development in Central America as a priority, we've got a real opportunity to make a difference." McAleenan also highlighted that $2 billion in economic activity comes through border ports of entry every day, though last week the president threatened to close the southern border if funding for the wall isn't approved. Trump's demand for the wall led to the current government shutdown, which is now in its second week. McAleenan said that with $300 million in funding from fiscal year 2017, there were currently 35 out of 40 miles of wall built. Raddatz then pressed McAleenan on the effectiveness of a wall, citing "areas of the wall that are clearly ineffective" due to people climbing over it and the use of drones to drop illegal drugs over barriers. "And what we're talking about is not just a dumb barrier, we're talking about sensors, cameras, lighting, access roads for our agents, a system that helps us secure that area of the border," McAleenan responded, adding that the $5 billion the president requested would fund about 215 miles of a wall system which has all of those capabilities included in it. 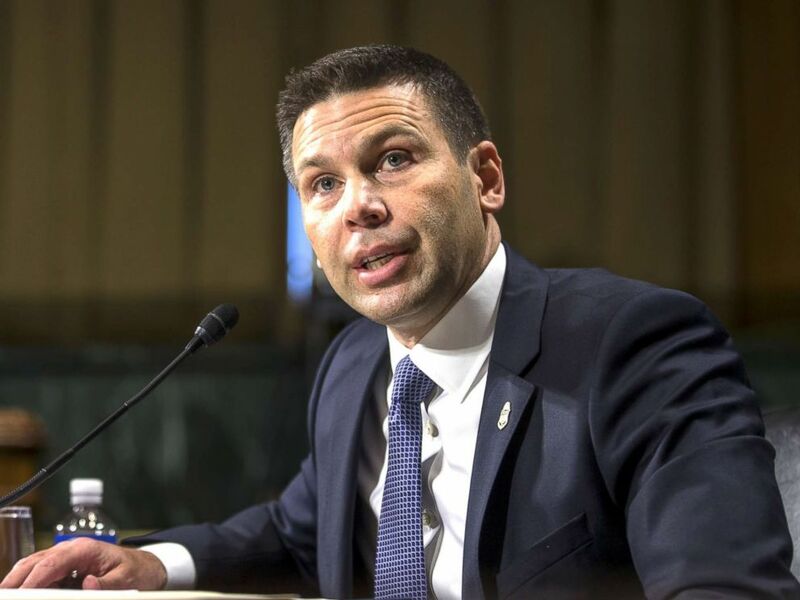 McAleenan said that beyond the physical security, his agency needs money to provide a better process and a different approach for families and children crossing the border. "We don't want them in border patrol stations, we want them in a better scenario for these vulnerable populations that we're seeing," he said. Raddatz pointed to the 1997 Flores v. Reno settlement which began the practice of releasing children after 20 days, as well as a 2014 surge in minors entering the U.S. as reasons CBP should have been prepared for more children now. McAleenan then cited Flores v. Lynch, a 2015 court case upheld by the 9th Circuit Court of Appeals in 2016, which he said "started this dynamic of families being released without any possibility of completing the immigration proceeding or repatriating those who didn't have a meritorious claim." He said, "We need a sober-minded, nonpartisan look at our immigration laws to really confront and grapple with the fact that children and families are coming into this cycle, that’s first and foremost."